This image was disqualified from the Fireworks challenge. rotated 90 degrees clockwise, leveled the dock, cropped, brightness/contrast, grunge-smudge-soften brushes, greyscale, and then I threw ALL of that out the window and played with some adjustment layers. I loved the "disolve" on this particular shot at 100%. I think it makes it look like a drawing. So in daring to be different and have people stop and say "WTF" after all of those color firework shots, I hope it pays off. It's a love it or hate it scenario but I thought it would be fun to see the reactions. Makes sense. Those 33 "10s" look real out of place. There seems to be almost two times too many when you look at the rest of the vote spread. what are "multiple accounts?" anyone? Message edited by author 2006-07-15 23:39:46. Message edited by author 2006-07-15 11:01:16. I loved the "disolve" on this particular shot at 100%. I think it makes it look like a drawing. I think you are exactly right! And the reason this photo definately appeals to me. Kudos for attempting to be different and succeeding well. Congrats on the 6th place, great shot! Message edited by author 2006-07-13 15:24:55. Distinctive shot! Wait, you rotated this 90 degrees? You were going to enter it with the dock pointing up on the left? I think this way is better. lol. Now that you mention it I don't know where I got the 90 degrees from. I think when you go to turn it clockwise or counter clockwise it says "90 degrees" in the program. But I had to turn it upward from on its side and chose the clockwise I believe. Message edited by author 2006-07-13 14:53:56. Message edited by author 2006-07-13 13:33:09.
wow, phenomenal job on this! highly impressed! hey there. congrats on your high score. i for one gave this a 10. so amazing! I'm so amazed! The voters *almost* got this right! This is easily the best in the challenge - amazing PP seeing the original - great work to get from there to here. Congrats on your top 10 placing with this out of the box presentation. Creative thinking and excellent results. Well done! After coming back to have a look at this shot again, and seeing the original, I like it even more. This one should get a special award for creativity in the post-processing phase. You took a mediocre shot and turned it into something that really stands out. I also want to give a very special thank you to those that chose this as a favorite. I now have 9 ! I wrote to each of you with a personal thanks! You all ROCK! This absolutely blows me away. Congratulations on your excellent shot and top 10 finish. Even with the low votes you managed to pull out a top ten. Congrats for being different and doing well for it. The original? Let me resize it. Be back! Here is the original. As you can see its a bit dark and barely needed a crop. I think I only had to crop it because of rotating it slightly to get the dock level. That is really a wharf and I should have called it that. lol. There were only about 18 people on the wharf. This a large lake and a small town display. The normal town goers don't really go much anymore so the crowds are minimal. I think the fact that there were so few people and so little confusion below in the shot and on the wharf made this appealing. I knew I had to get a foreground "something or other" so I walked around the lake till I had the dock in front of me. I did toy with the original and in color but the light inside the gazebo at the end of the wharf had that yucky incandescent lighting glow. It was "ok" but not great although it balanced the shot. Also the fireworks were way up, way low and then medium. I got a few captures of it medium height and this is one of them. Message edited by author 2006-07-13 00:40:45. Thank you jbsmithana. Shhhh, but I agree with you lol. I did get more 10's then the top winners though! :) It's just one of those things. I did get some 1's, 2's, and 3's from the haters of this love or hate it shot and that was the downfall for ribbon-hood. This was my favorite shot. I was so tired of standard firework shots and when this came up it just blew me away. Should have been a ribbon. Great way to make your shot stand out from the crowd! Well done. This is simply wonderful! Great job! The effect on the dock is really cool. A very unique take of fireworks. Nicely done! Almost surreal! I like the PP very much. i like this, looks very interesting. good idea. Now this I really like. A superb and unique take on this challenge. 10! negative images often get a bad rep, but I think this actuallu works very well with the image, giving it something different that you wouldn't normally expect. Hope this does well, and good luck! I like the composition, I just wonder if it might have been better in the original colour? Still... one of the more creative photos in this challenge. Great visual impact. Original and definitly one of my favorites in this challenge!! I've seen fireworks from every other POV in this challenge - thank you for taking time to show them to me in a new light. I hope this goes over well, that you get the ribbon you deserve for compositional and creative excellence - but I have no faith in the voters to see that. Interesting take on the challenge. The longer I look, the more it grows on me. Has an Asian feel to it. Definitely unique. Nice job. I like it, it was not what I would have expected! I also played around with inverting my image but I didn't have anything of interest other then the fireworks... the dock works. I can't vote, but that doesn't stop me from being impressed by this image. Very nice. Hmmmmm....already double the views of all other images....played with the processing...from Florida....not hard to figure out this was yours maestro. It is a fantastic composition and the idea for the processing was very creative...Nice to see it's so well received. I like this image a lot. To me it amost looks like a Japanese Ink Painting. Very Creative. Good Job! Wow! This is so unique and perfectly executed! Love it! Great job! Original idea [I think] I like it! Haha. I'm giving you a 9 just because. 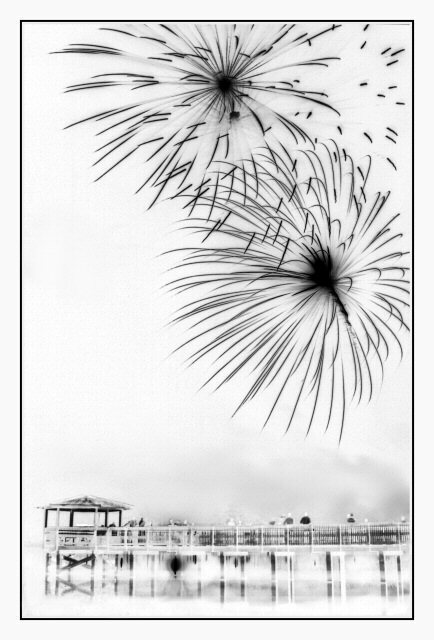 very interesting cocept for a fireworks display,tells the story well. The negative of this is very good, too! Proudly hosted by Sargasso Networks. Current Server Time: 04/21/2019 04:19:34 AM EDT.